Home > News > Westminster To ‘Brexit’ To Bristol? Westminster To ‘Brexit’ To Bristol? In the epic furore following last Friday’s controversial Leave vote was the suggestion by some that London, a predominantly Remain area, should secede from the rest of the UK and become independent. If that ever, in the very unlikely event, came to pass; then you’d imagine the House of Commons (and Lords) would find itself out on its ear and looking for a new home. 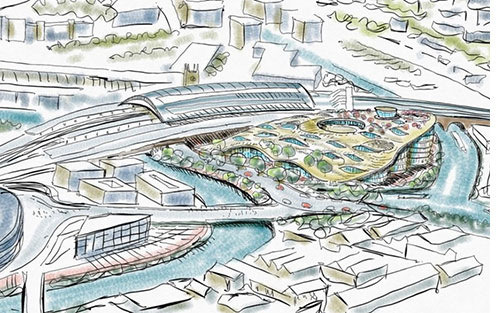 Well: one wonders if Studio Egret, a Bristol-based firm of architects, is staffed by telepaths, as it recently came up with a new design for the mother of Parliaments – and one on a site adjacent to Temple Meads station in Bristol (another Remain enclave, as it turns out). Of course, the idea wasn’t triggered by the referendum, more by the fact that the current building is well-known to be falling apart and the cost of bringing it up to 21st century standards will be in the region of £5.7bn. £5.7bn? Sounds suspiciously like one of the big numbers bandied about by both sides in the run-up to last week’s vote. And in this it seems that the political class – currently in some disarray – may not be entirely suffering a ‘disconnect’ from the rest of us as accused; as ‘move or improve’ is dilemma often faced by all of us when it comes to our own homes. The arguments for ‘move’ are obvious: new surroundings, possibly a brand new house in immaculate order, new jobs or new schools. Against it is the cost of moving: solicitors’ fees, estate agency fees, removal costs and, of course, a hefty whack of stamp duty to pay on the new place. Thus the benefits of improve become obvious too: whereby more space, new uses of space, adapting to changed priorities and changes in lifestyles can come in much more cost-effectively by working with an existing property. Depending on the nature of works and the ambition of any proposed move; an extension, conservatory or loft conversion might well be the same as stamp duty alone – and without the stress and hassles of chains, gazumping and the hard work of physically upping-sticks. At Eurocell, we consider ourselves in the van of home improvement, both in trends, great design and quality products. Whether it’s Aspect bi-fold doors bringing open plan to your kitchen and living spaces; energy-efficient Equinox conservatories that add new comfortable space; market-leading Dales doors and Modus windows that look great while saving you money or Skypod lantern roofs delivering masses of daylight into the heart of your home; we, at Eurocell, have got the lot. So turn off the news – it’s not helping you know – and have a look here to see whether in the end, when it comes to your own home, you’d rather Leave or Remain.